Beginning in the second year of the Tattooed Poets Project, we experienced the thrill of having poets from previous years return to share more ink. This year is no exception, and the first of two repeat contributors is Michael Henry Lee. Last year, he contributed "work inspired by his spiritual convictions, with work spanning three decades by three artists in three very distinct parts of the country." "This year" he informs us, "reveals a more earthy side; with work again spanning three decades by two artists from the heart of America and the sunshine state." "The piece began with the oh so typical heart and initials by [his] then girlfriend and now wife of over thirty years. Gradually several butterflies, stars, comets, clouds, and lightning were all added by a Kansas City Missouri artist named John. Fast forward to Saint Augustine, Florida, and a great shop called Tattoo Garden, owned and operated by a super artist Tattoo Mike. 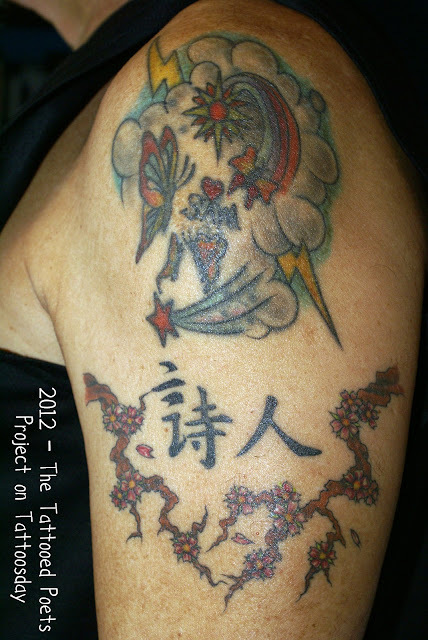 He re-colored and revitalized the original piece on [my] last birthday and soon after the kanji for poet and the cherry blossoms were added." Mr. Lee got the kanji to remind him "of the gift he has been given to pursue and ... the cherry blossoms celebrate the beauty and brevity of the life in which he has to pursue it." Mr. Lee provided us with the following poems, which originally appeared in Haiku News in response to various news stories. They are the sole property of Mr. Lee and may not be used without his explicit permission. Michael lives in the nation's oldest city with his wife, two cats ,and numerous bonsai trees. His work has appeared in The Heron's Nest, Icebox. Berry Blue Haiku, The Mainichi Daily News, and Haiku News. His most recent award was a first place in the traditional category and runner up in the contemporary category for the 2012 Haiku Now National Haiku Foundation contest. Thanks to Michael Henry Lee for contributing again to the Tattooed Poets Project! Be sure to check out his contribution from last year, as well, in case you missed it. This entry is ©2012 Tattoosday. The poems and tattoo are reprinted with the poet's explicit permission.